A comprehensive Customer Loyalty Software that can be seemlessly integrated with Newsagency POS Software. In todays competitive retail environment, offering a point of difference is often vital in your attempts to attract new customers. Offering your customers a loyalty program could just be that point of difference that makes a difference! The Customer Loyalty program works on an automated reward points system. In designing the loyalty program, flexibility and ease of use were the main criteria. Either the accrual or redemption of points can be based on product categories, sub categories or individual items. Added flexibility is provided by allowing different product groups or items that can accrue points as against those available for points redemption. eg. a newsagency may set up a magazine loyalty program that allows its’ customers to accrue points on magazine purchases but only allows the redemption of points (Discounts applied) on drinks. Almost any combination is possible. When a new loyalty customer is added to the system a unique barcode label is produced that is adhered to the loyalty card* or you can pre-manufacture loyalty cards with a unique barcode which can be assigned to the customer when they join your loyalty program. The loyalty card is used by the customer with each purchase and points redemption. The card can be scanned at any point within the sale. 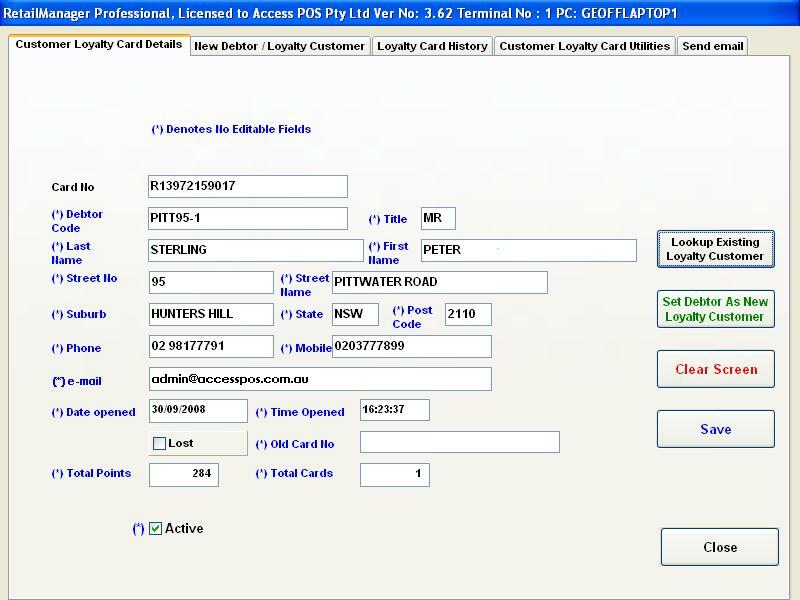 The Customers name, previously accrued points and card number are displayed to the POS operator. A welcome message "Welcome back Mr. Smith" can be displayed on a Customer Pole Display. As each new item is registered, the additional points that will be accrued or the required points needed to redeem each dollar of discount are displayed. 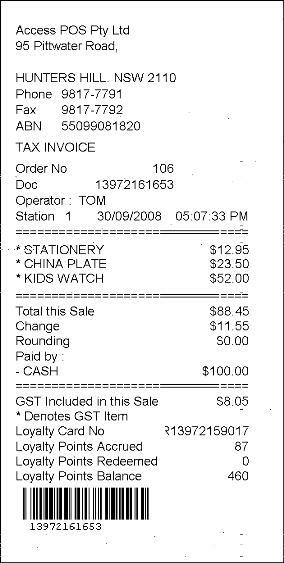 The receipt given to a loyalty customer, apart from the normal purchase detail, shows the previous points balance, points earned from the current transaction, number of points used for redemption (if any) and the new points total. Individual or bulk loyalty statements can either be printed or emailed. 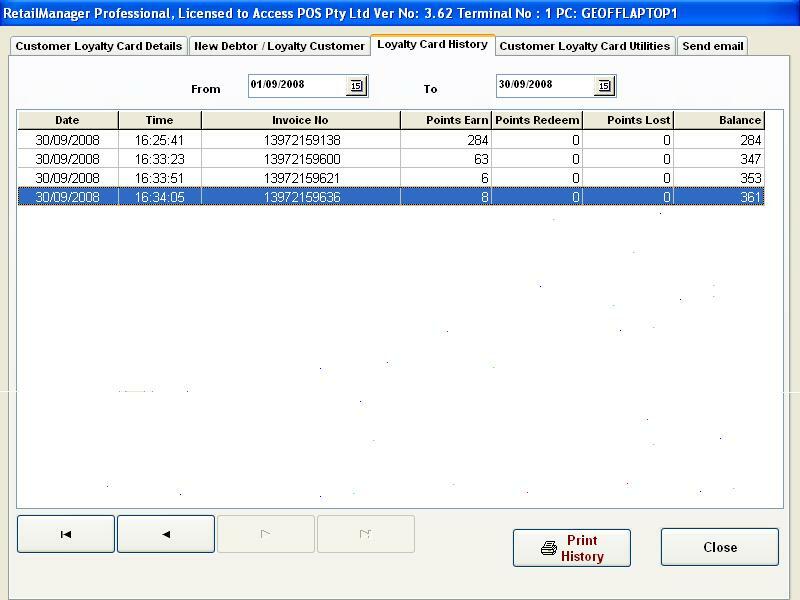 Loyalty statements detail all transactions for the nominated period including points accrued, points redeemed and points lost if the points expiration option is used. The addition of the Customer Loyalty Software module could provide you with a great tool to enhance your business. * A barcode Thermal Label Printer is required to print Customer Loyalty labels. This same printer can also be used for printing product and shelf labels. You can not purchase the Customer Loyalty Software Add-on as "stand-alone" ie. 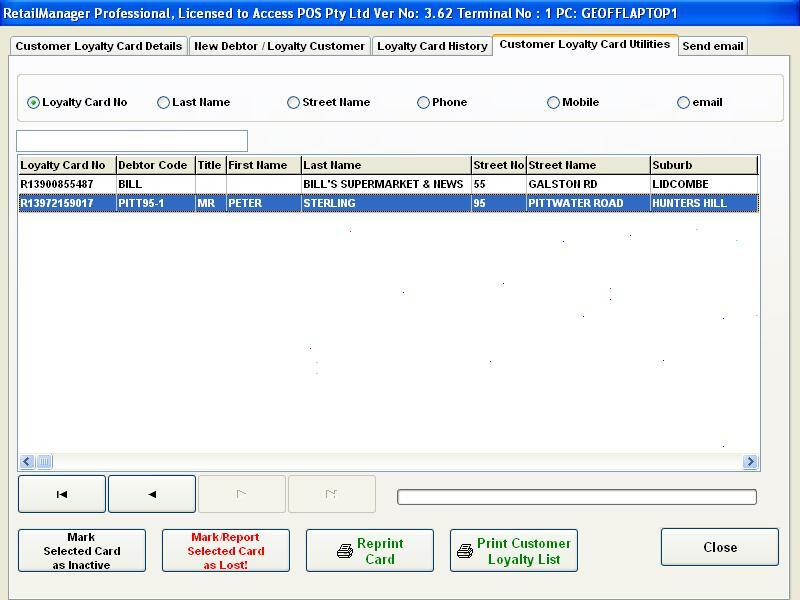 You must already have purchased the core Newsagency POS Software license or you can purchase the Customer Loyalty Software Add-on at the same time as the core Newsagency POS Software product. You need to purchase the same number of Customer Management & Loyalty Software licenses as the number of computers you are licensed for the Retail Manager POS Software. ie. if you are licensed for four (4) computers then you would need to purchase four (4) Customer Management & Loyalty Software licenses. Just a quick note to thank Nick for outstanding customer service I had from him this morning. Helpful, polite and calmly analytical…I would appreciate it if you could pat him on the back for me!